Justin Bieber Stops By Concert With Baskin Champion! Justin Bieber hit the town with one of his female friends last night! 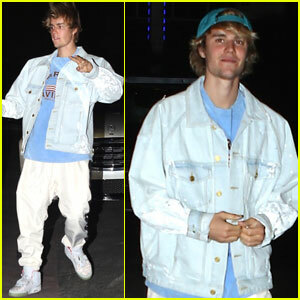 The 23-year-old musician was spotted heading into Craig David‘s concert on Tuesday night (March 20) at The Roxy in West Hollywood, Calif.
Justin was reportedly joined by 22-year-old model Baskin Champion, who is the sister of his pal Patrick Schwarzenegger‘s girlfriend Abby Champion. According to ET, Justin spent most of the evening hanging out with Baskin in the VIP section of the venue. Meanwhile, Justin is reportedly on a break from girlfriend Selena Gomez. Toward the end of the night, Justin hopped on stage to give David some praise. “He’s an amazing guy and he’s an incredible artist. I’m just glad to be here, I had so much fun!” Justin said. 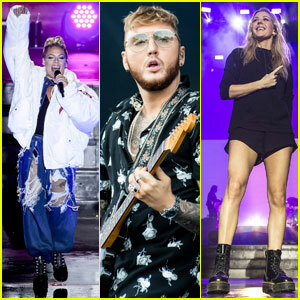 Pink, James Arthur, Ellie Goulding & More Hit The Stage at V Festival 2017! Pink puts her hands up in the air as she hits the stage as the headliner at day three of the 2017 V Festival held at Weston Park on Sunday (August 20) in Stafford, England. 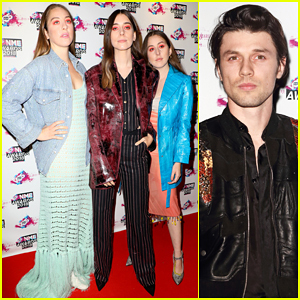 The 37-year-old entertainer was joined at the big musical event by Ellie Goulding, Jason Derulo, Anne-Marie, Craig David, Ella Eyre, James Arthur, Jess Glynne, The Vamps and Clean Bandit. “Thanks Vfest. Thanks England. Thanks festival peeps, thanks Germany, Hungary. Thanks all of you beautiful people. Summer 17′… in the books….,” Pink captioned with one of her Instagram posts. Pink also shared an adorable photo of her son Jameson, who was born in December. Just about ready for you Vfest!!!!! Little Mix Lands First No. 1 Album in the U.K. With 'Glory Days'! A major congrats is in order for Little Mix! The girls – Perrie Edwards, Jesy Nelson, Leigh-Anne Pinnock, and Jade Thirlwall – just scored their first No. 1 album on the U.K. charts with 96,000 copies of Glory Days sold in its first week, according to BBC. They beat out Metallica‘s 10th studio album Hardwired…to Self-Destruct and Bruno Mars‘ 24K Magic. This is also now the highest first-week figure for a British girl group since The Spice Girls‘ Spiceworld in 1997. Pictured: Little Mix performs on stage during the 2016 Free Radio Live concert at Genting Arena with Olly Murs, Craig David, and Dua Lipa on Saturday (November 26) in Birmingham, U.K.
Luke Evans Suits Up To Support Eva Longoria at London's Global Gift Gala! Luke Evans looked mighty fine while hitting the purple carpet at the Global Gift Gala over the weekend! The 37-year-old actor attended the event to support Eva Longoria on Saturday night (November 19) at the Corinthia Hotel in London, England. The Global Gift Foundation is a philanthropic non-profit organization that aims to create a positive impact on the lives of children, women and families who are in need. Eva is one of the honorary ambassadors! Some other celebs in attendance included Gordon Ramsay and his wife Tana, Anastacia, Alesha Dixon, Jack Whitehall, Rebecca Ferguson, Pamela Anderson and performer Craig David. FYI: Eva is wearing a Victoria Beckham gown.